I’m sure you’re all bored of hearing me rabbit on so I thought I’d let Hot Chocolate, our Kadey Krogen 38, take centre stage with some pics of her in her current state! 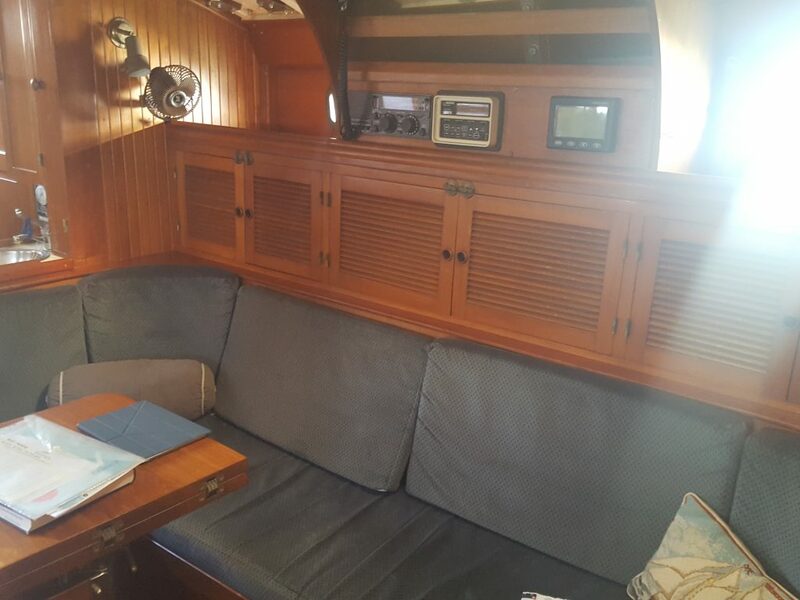 There’s a lot we want to do to make her more homely, but if we start spending money on her interior we won’t have a life raft and I know what my Mum would say about that! There is a bit of wood that slots into the bottom section to make it more of a double bed. 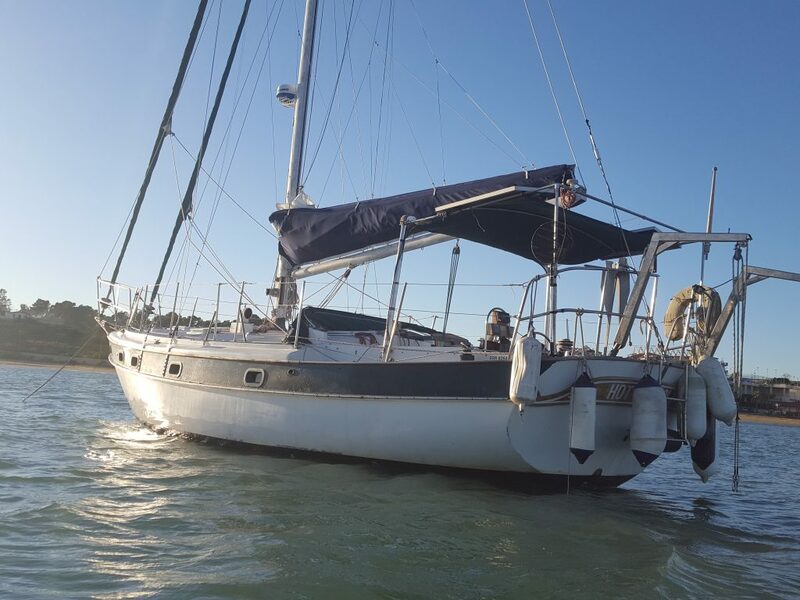 We’ve had guests stay in here who have reported it to be comfy enough, except the time when I managed to soak the whole mattress and all of our friends belongings by switching on the salt water wash down mid sailing trip. 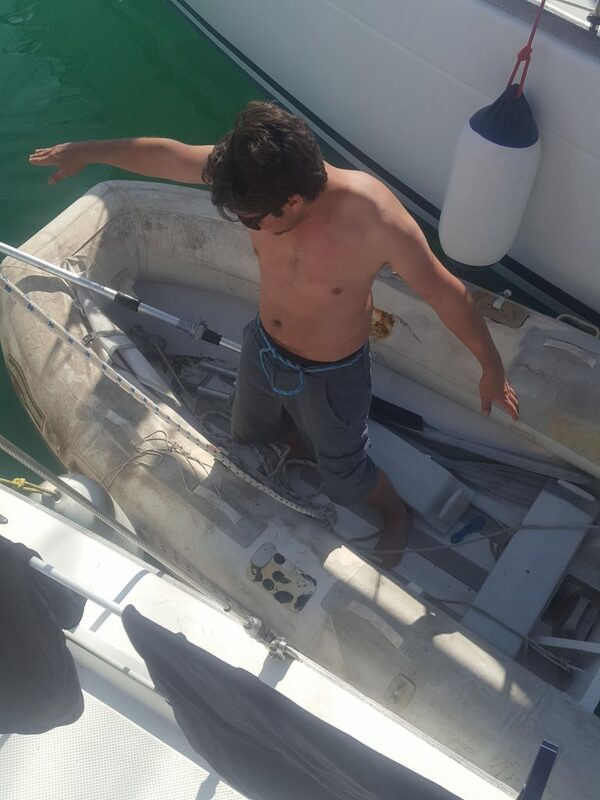 Along with the trauma of thinking the boat was sinking as I watched salt water gush through the cupboard, I also had to make up a bed for our guest in the salon and he enjoyed a few less comfortable nights sleep listening to Adam snoring (Sorry Tom!) 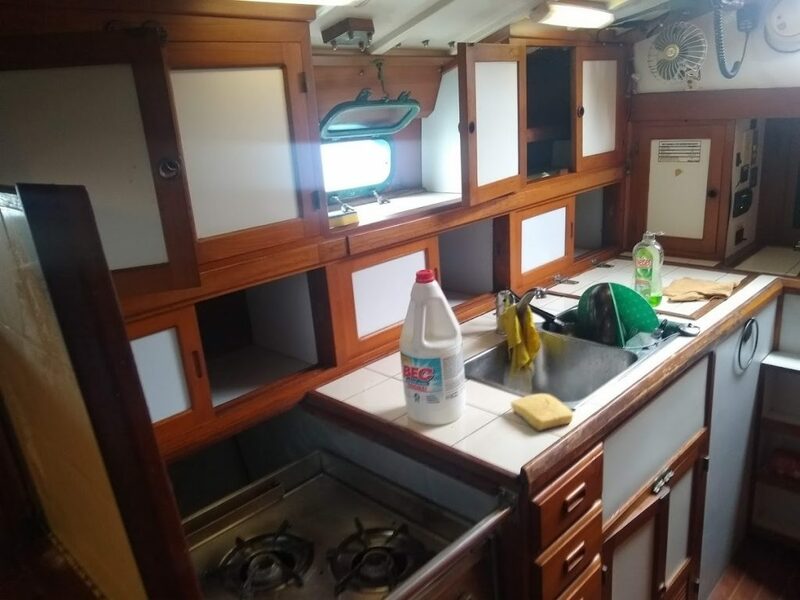 The other unfortunate thing about the anchor locker being in the cupboard at the back is that if we don’t wash down the anchor before bringing it back in it gets a bit smelly. But don’t let that put you off coming to stay! It has it’s own sink and a hole you can sneak out of and head to the pub without anyone knowing! 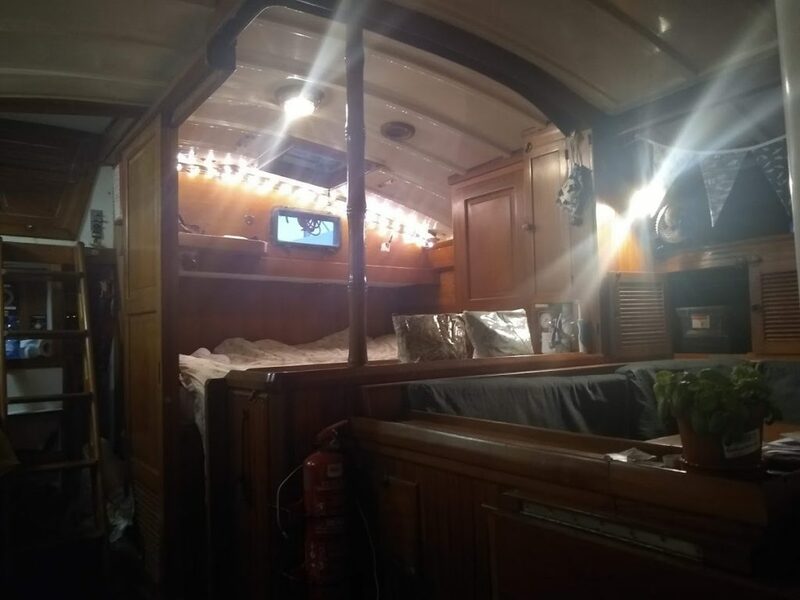 For a boat it’s pretty open plan, so our bedroom is part of the salon and the kitchen. It makes the boat feel really spacious compared to lots of boats we’ve seen. There is a sliding door and a curtain we can put up to make it into a proper bedroom. We’ve got our own sink, which we can’t use because it leaks and we can’t buy a new tap yet….because, you know, liferaft. I love the fact you can have a little chat with the person in the cockpit while you’re in bed and I think it will make me feel better about night passages if I’m on watch on my own, knowing I can shout in and wake Adam if I need to! Not that any amount of shouting would ever wake him. It doesn’t have a sink, but it does have a separate shower! I love this so much. We don’t have to worry about soaking the toilet roll every time we use it as it’s basically a separate room. This is really unusual on a boat this size, so I couldn’t care less about there not being a sink! The toilet is ugly and you have to pump it 50 million times every time you use it, but at least we’re getting super strong arms. Look-we have been cleaning! I promise! It’s small but it has everything we need. There are plenty of cupboards and drawers and we can make extra worktop space as I’ve explained below. The oven is a bit of a death trap but we have learnt to navigate it so as to avoid injury! It doesn’t close properly, wasting gas and making the knobs screaming hot so if you forget and go to turn a hob on you’ll get a nasty shock. One of the hobs is broken and we’re not 100% sure that something hasn’t died behind the oven, as we can’t get behind it to clean without dismantling it. We moved the fridge so that it’s now much easier to get to, one of Adam’s first big projects! The tap leaked but I think I managed to fix it, after making it a whole lot worse to start with! Things we love-the original wooden name plaque, complete with dolphins. The bowsprit for dolphin watching! 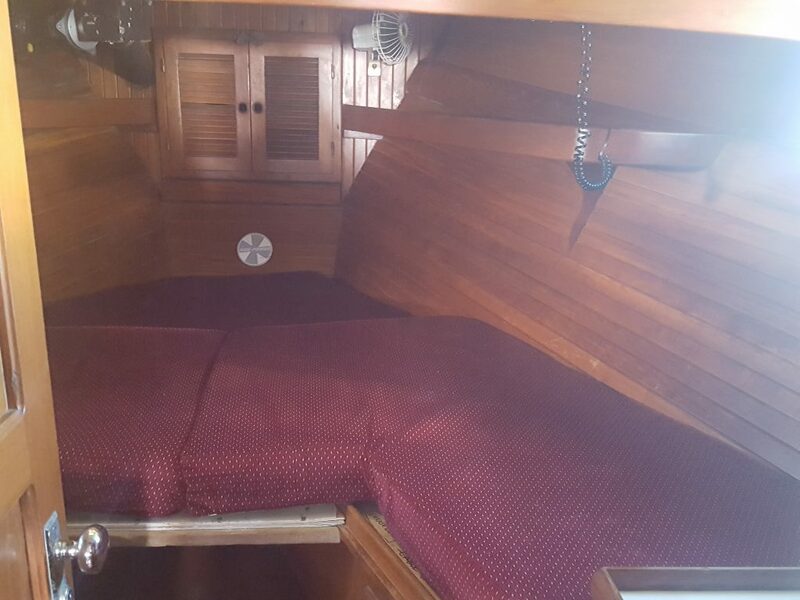 The spacious deck and cockpit and the wooden steering wheel. The outside storage space and the new sails. 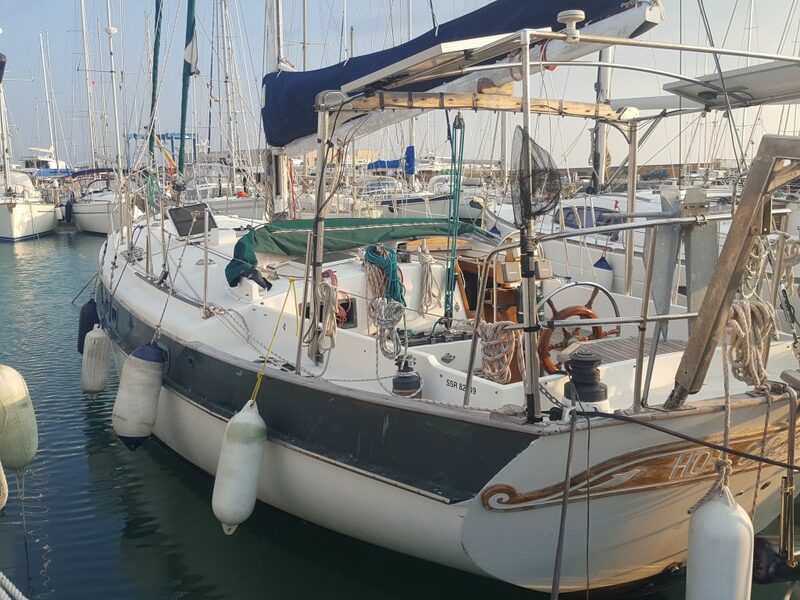 Her teeny tiny keel which means we don’t have to worry about the sand bank getting in and out of the marina and figuring out how to use the centre board and the aft board to make her sail even better. 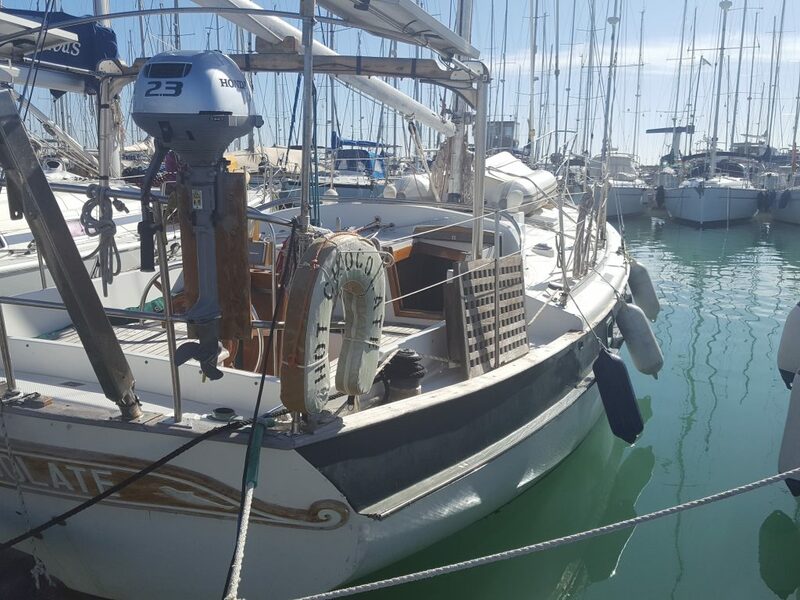 Things we don’t love-her sad looking paint work, the leaky lockers and the dingy davits. The sticking anchor and the broken compass. The bimini and the lack of solar. The winch on the mast and the boom gallows that we haven’t figured out yet. 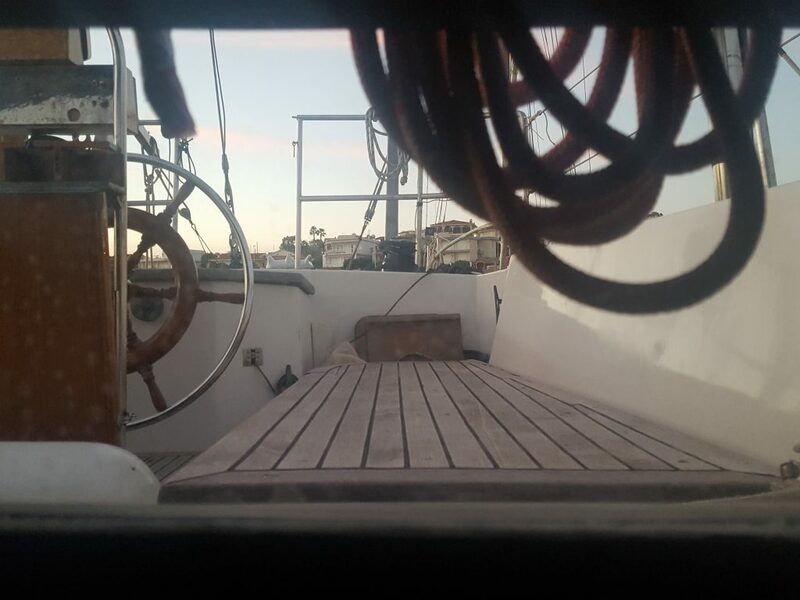 As you can see there is still A LOT of work that needs doing out here, some of it is just cosmetic and will have to wait, some of it needs to be done before we start sailing properly. We aren’t sure how long our inherited tender is going to last….perhaps till next week?! We’ve fondly named her Love Me, because she needs an awful lot of love if she’s going to make it through the summer! We can’t afford a new one, so either she lasts till the winter or we don’t leave the boat all summer! We love the detail on this boat. 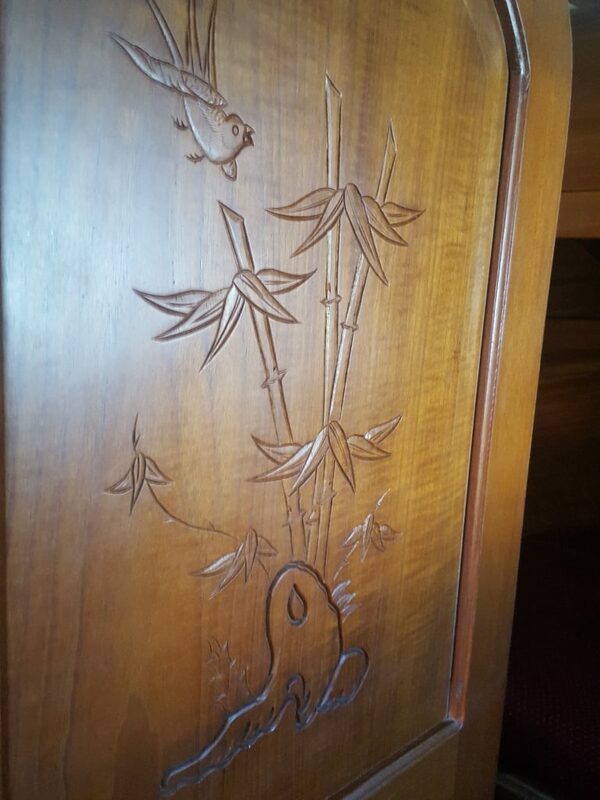 It was made in Taiwan and there are few Asian twists to the design, like this door carving and the bamboo cane that holds the wiring and is great to steady yourself when the boats heeling. We also love the extra worktop that drops down onto of the stove and the pullout worktops in between the cupboards. Having sinks in both bedrooms feels very luxurious too for such a small boat! I never realised how much I would miss the means and the money to make somewhere feel like home. Here, engine parts and chart plotters take priority so there is no time or cash to spend on pretty things. Luckily my friends must have been thinking a little more clearly than me before we left because the things I enjoyed unpacking most were their gifts. 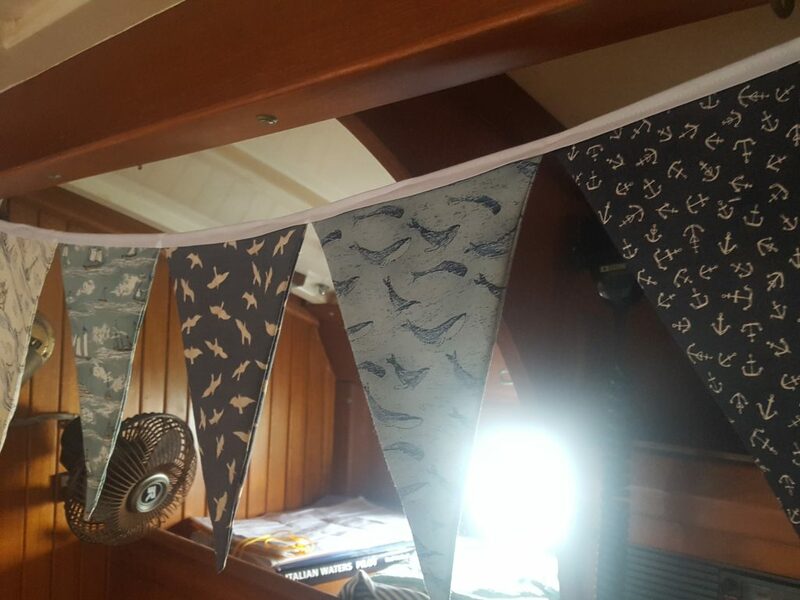 The bunting in the salon was made for us by one of my oldest friends, Rach, who somehow found time to source boat themed fabric, sew bunting that looks better than any I could have found in a shop, and still hold down a job and look after a two year old! If you also fancy writing me a blog post on time management Rach, then just let me know! 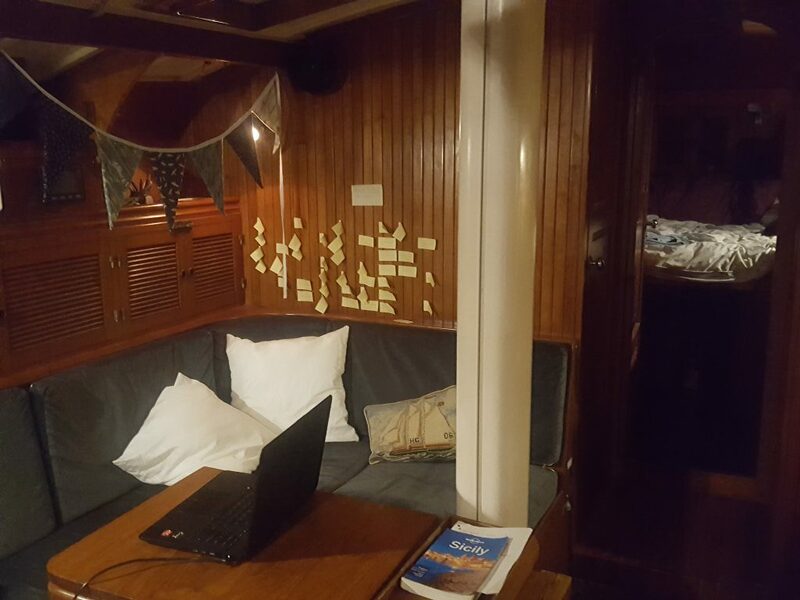 Hanging the bunting instantly made Hot Chocolate feel more friendly and it’s always one of the first things I see when I come into the boat. 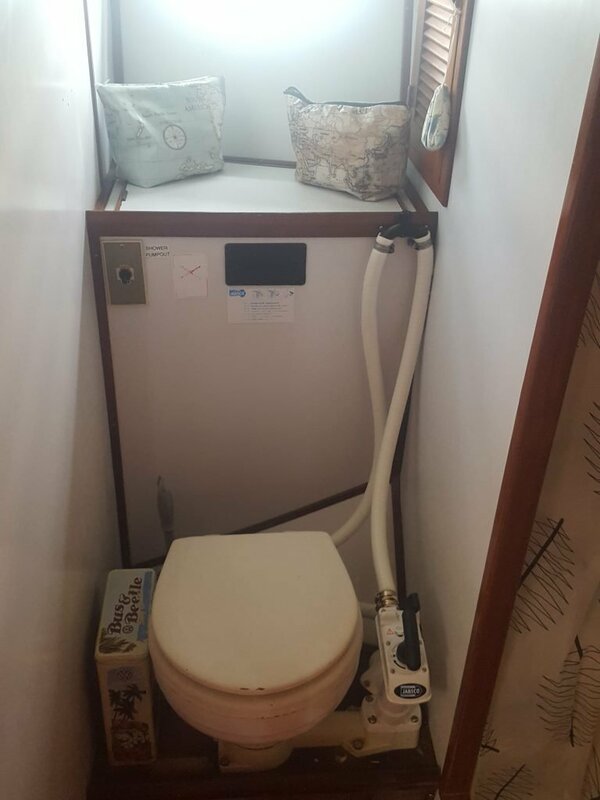 Our bathroom is the least attractive room on the boat. We splashed out on a £5 toilet holder to replace the yellowing plastic one that had been stuck on the wall and the shower curtain looks like it has many interesting stories to tell. 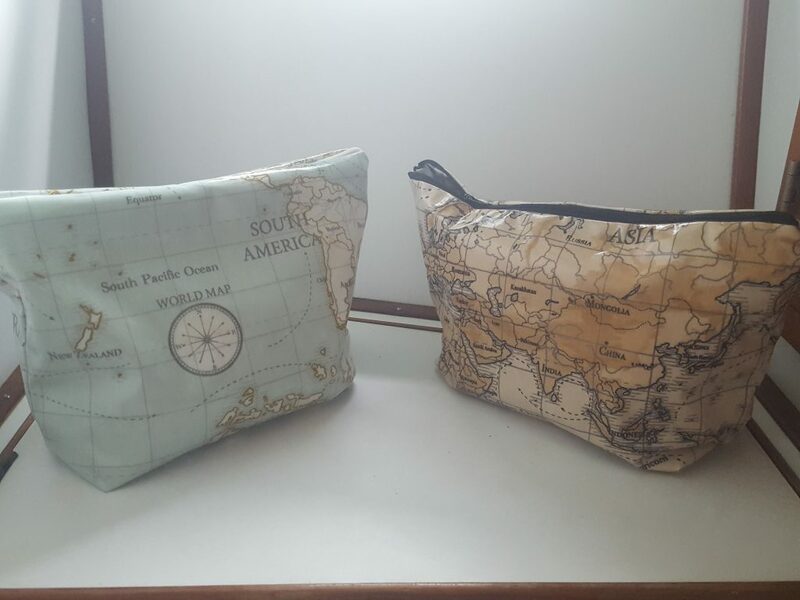 But when you walk in and see the beautiful his and hers waterproof wash bags covered in maps (I’m obsessed with maps!) the bathroom is kind of transformed. They were made for us by my friend Julie who sews the most incredible products for charity. So I guess I can’t write a post without rabbiting on, as I’ve still written over 1000 words on this, sorry about that! But hopefully the photos have satisfied the nosy among you and you feel like you’ve had a little tour. You can see more photos here!